We have carotid arteries located on either side of our neck. These arteries extend from the aorta to the base of our skull. 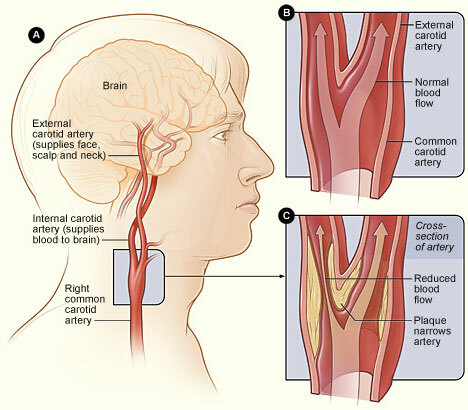 The purpose of the carotid artery is to deliver blood to the brain and facial areas. Over time, the accumulation of fatty plaque causes these arteries to narrow and stiffen, resulting in a condition called atherosclerosis. Once atherosclerosis – also known as hardening of the arteries – sets in, blood flow is significantly reduced. 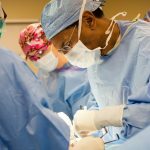 When this happens, surgery is necessary to restore proper blood flow to the face and brain. 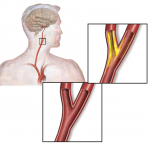 The most serious aspect of carotid artery disease is the clots that can form on the plaque. Both the plaque itself and the clots can break loose, travel to the brain, and cause an ischemic stroke. This can result in permanent brain damage and even death.